I was recently looking through boxes of things we haven’t even opened since we packed them up in Brooklyn before moving to the farm . Surprisingly, there are an awful lot of boxes filled with “important” belongings that we’ve hardly missed in the last year and a half. Such things as my teapot (which after opening many boxes I still can’t find), our vast collection of books, kitchen towels, our Roomba vacuum…and many other goodies, haven’t seen the light of day for quite awhile. When I complained about the rediculousness of our DVD collection and suggested we get one of those big binders, he would have none of it. 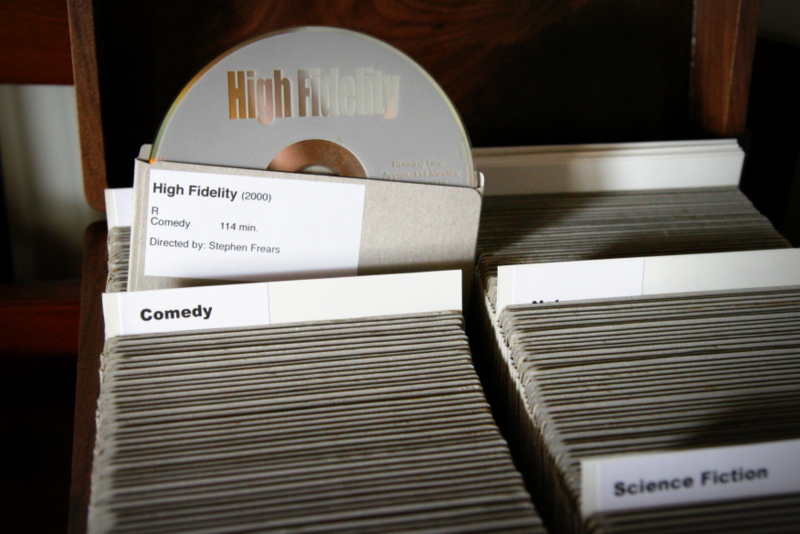 He envisioned a sleek DVD storage system – a file if you will – and got right to work. 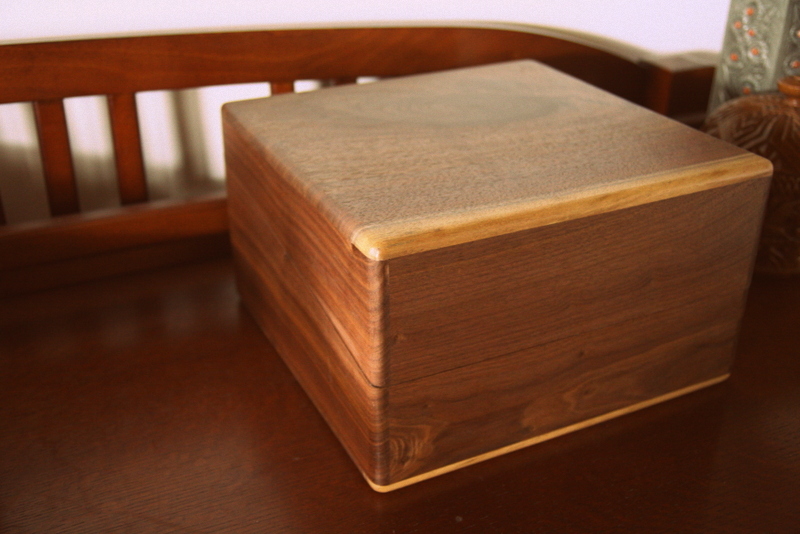 M has been creating some awesome boxes from the cut off sections of our home-milled lumber that are too figured or the wrong size to use in a furniture piece, but have character. (You can see them here on our website, or here at our Etsy store). 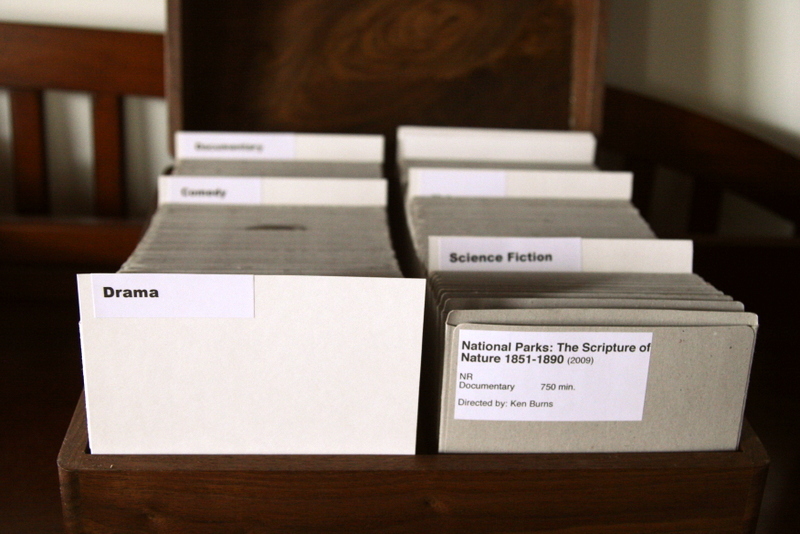 He adapted his wooden box design to accomodate a whole collection of DVDs and we quickly sourced some lovely recycled cardboard sleeves and labels. The new system reduced the mass of cases that took up an entire bookshelf in our last apartment to one elegant walnut box. 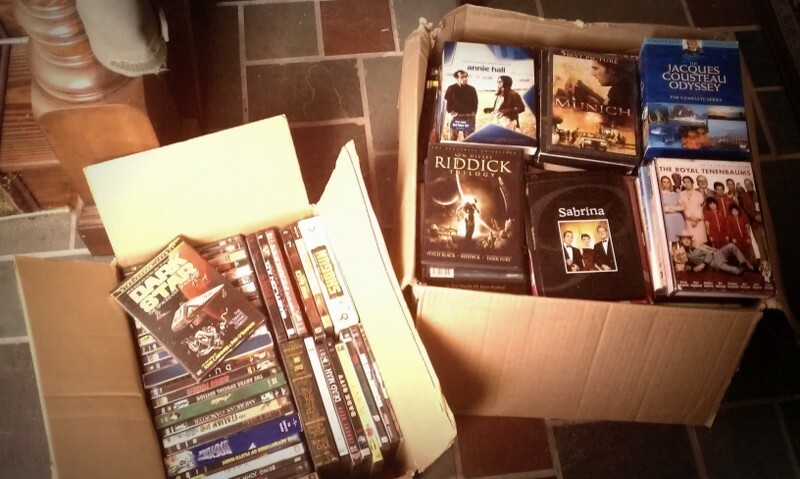 Inside the box, we’ve organized the DVDs by genre and adapted the genius Netflix label format stating the film title, director, rating, run time and release year. We found a great directory where you can enter a SKU number from the case and get all of these details in an easy to mail merge spreadsheet. Each disc is in a simple little sleeve made from recycled cardboard. I think it’s much sleeker than the plastic-y sleeves I’ve typically seen at media stores, and much nicer than those ugly binder sleeve pages. I’m so pumped about it! If you like our little system…don’t worry, we’re going to work up some kits and sell them the next time we’re at the Brooklyn Flea! We also hope to get them up on our Etsy store sometime soon. Or, you can always contact us if you’re reeeeeeeally excited about getting one. Here here for reducing clutter! Tags: Etsy, housewares, woodworking. Bookmark the permalink. In fact, the wood used is walnut that we milled here on the farm! The paler wood is the sapwood (nearer the bark) and the darker is heartwood. It makes for a really striking contrast! What a lovely storage system! Elegant and nifty! Looks like a blending of wood-types, right? Little teak / mahogony- handsome!